Making "Nature" is the first book to chronicle the foundation and development of Nature, one of the world’s most influential scientific institutions. Now nearing its hundred and fiftieth year of publication, Nature is the international benchmark for scientific publication. Its contributors include Charles Darwin, Ernest Rutherford, and Stephen Hawking, and it has published many of the most important discoveries in the history of science, including articles on the structure of DNA, the discovery of the neutron, the first cloning of a mammal, and the human genome. But how did Nature become such an essential institution? In Making "Nature," Melinda Baldwin charts the rich history of this extraordinary publication from its foundation in 1869 to current debates about online publishing and open access. This pioneering study not only tells Nature’s story but also sheds light on much larger questions about the history of science publishing, changes in scientific communication, and shifting notions of "scientific community." Nature, as Baldwin demonstrates, helped define what science is and what it means to be a scientist. 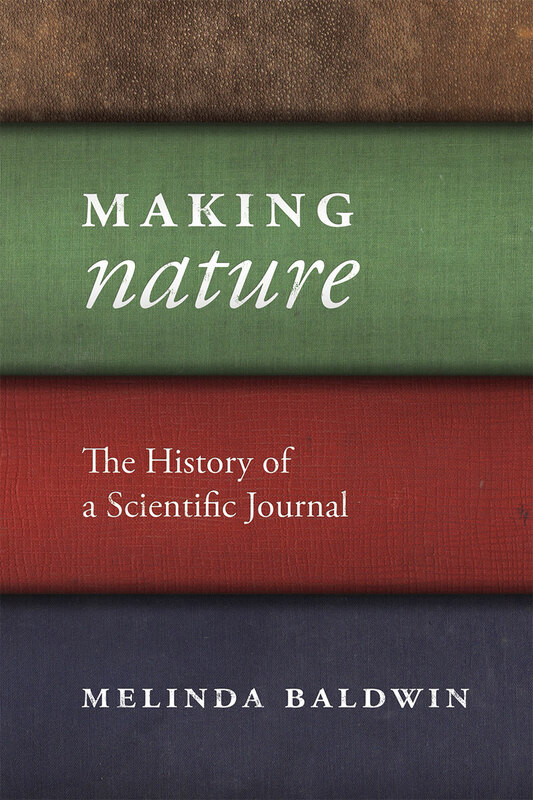 "A concern with the moral and social aspects of science, as seen through science publishing, pervades Melinda Baldwin’s skillful history of the weekly journal Nature. . . . A positive but not hagiographic account." "Historians of science have long wrestled with the problem of how to tell a story that engages the rich detail of specific historical contexts while also articulating larger, more broadly applicable themes. Baldwin approaches this challenge with ingenuity in her first book, a history of the journal Nature. The account spans more than a century and presents “a microcosm of the history of the print journal” as well as a microcosm of major developments in the history of science. Through the pages of this most prestigious of publishing venues, the author peers into debates about who counted as an authoritative practitioner of science, how the scientific community should navigate the turbulent tides of international politics, and what shape the community’s efforts to police its publishing practices should take, among others. The writing is fluent, and the breadth of subject matter makes this book a flexible overview of a number of historical topics and eras in addition to a sustained, in-depth study of a journal that has long stood as a pillar of the scientific community. Highly recommended." journal Nature. Given current debates over the future of scholarly publishing and scientific communication, particularly with issues surrounding open access, Making 'Nature' is an important work that brings a vital historical perspective to bear." "Making 'Nature' revisits several on-going debates, and is roughly chronologically structured by the many case studies about Nature’s editors, international events and controversies. Baldwin adds to the growing scholarship on scientific publishing, providing the first dedicated ‘biography’ about one of the world’s most important journals. That contribution is important and timely because scientific publishing has proven itself a solid source for institutional prestige and income in the last decades. Baldwin’s book challenges the reader to reconsider modern and contemporary history, to question scientific institutions that hold power, and to re-examine old myths in science history." "We often think of scientific journals as receptacles for knowledge created elsewhere. But Baldwin shows that Nature, one of the premier journals in the world, was not a passive vessel, but rather a site where the rules of science themselves were debated and developed. Its pages were where scientists defined what it meant to do science: professionalization, peer review, science and internationalism, and the role of science in the public sphere. Making "Nature" presents a powerful argument for the critical role of publishing in the creation of modern science." "Nature’s journey from a relatively unsuccessful Victorian magazine aimed at the general public as much as scientific practitioners to its current position as the international benchmark for modern scientific publishing is one of the most important stories in the history of science. Melinda Baldwin tells it with aplomb, exploring the journal’s shifts towards specialism and then internationalism, and focusing on the editors, from Norman Lockyer to John Maddox, whose distinctive personalities had such an impact on how Nature communicated, and indeed shaped, modern science. What is particularly impressive about Making “Nature” is that it covers a period of more than a century and a half, from the 1860s to the present, while maintaining the same high levels of insight and expertise. As such, the book will be required reading for anybody interested in science and the media across the whole of the modern age." "The book is addressed not only to the readers of Nature, but to all researchers, editors, journalists; to anyone who is interested in the world of science and communication. Communicating science is not easy. It requires special skills, a great sense of responsibility and a certain degree of passion. It requires a profound consideration of what science is and who is allowed to make claims about scientific knowledge. The debate is only apparently concluded and Making Nature by Melinda Baldwin offers us a matter for reflection that cannot, and should not, be missed." the culture of scientific publication."